This report with the May UPDATED ‘FACTS’ from the Washoe County Assessor Records since last posted for April, 2018, in An ArrowCreek Property Value Update (April 2018 from Washoe County Assessor Records), shows that we have transitioned into the Spring buying/selling season with an additional five properties changing owners during this reporting period. This is down by 50% from last month. Custom Homes on the Golf Course (Non-residential area) now exhibit a 12.8% premium to custom homes not on the course. In the meantime, semi-custom homes continue to sell at about the same price regardless of their position in the community. 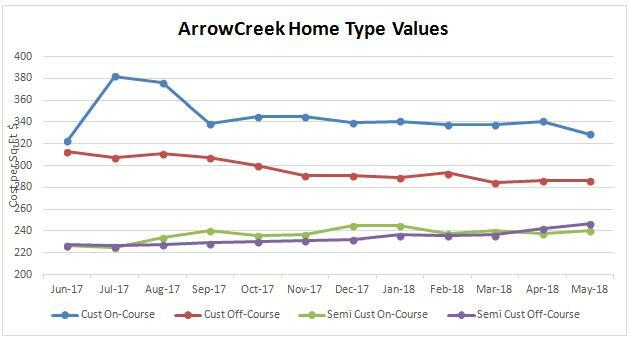 This, of course, leads to the question of ‘The value proposition for ArrowCreek properties?’ One of the key ‘propositions’ is that ArrowCreek owners’ have the option to join ‘The Club at ArrowCreek’ or not to join. This is an individual choice of freedom not given other gated communities. 1. ArrowCreek properties have stayed in the premium class within Washoe and Douglas Counties. As you read this report you will see that prices have improved for properties on the golf course, with an average appreciation rate of 12.5% over this past year, while prices for homes not on the golf course have appreciated by 6.8% over the same period. With five properties in five different neighborhoods changing hands this past month, there wasn’t a “hottest” neighborhood. a.) Five (5) properties were recorded sold in ArrowCreek between 13 and 27 April 2018 (per the Washoe County Assessor, who appears to be running a month late as the data was extracted on 23 May and the last ‘sale’ recorded was 27 April). This brings the total number of properties transferred over the past rolling year to 98 or 9.0% turn-over rate for our community. This remains a relatively low rate, still in the single digits, that may be attributed to a general satisfaction with living in our gated community and/or a positive perspective on our amenities and an emphasis on the secure stable environment offered within ArrowCreek. b.) Three (3) properties on the golf course (where the property boundaries actually touch the golf course, not just have a ‘view’ of it) were closed during this reporting period. The rolling average selling price for homes on the golf course now stands at $290.83 per square foot. This is a decrease of $2.30 per square foot from April’s value, based solely upon the statistical rolling average calculation. The 12-month rolling average sales price increased to $1,160,107.14, again based upon statistical methods. No additional lots on the course were sold. The rolling average selling price for undeveloped property on the golf course still stands at $256,714.02 per acre. c.) Two (2) properties were sold that are not connected to the golf course. The rolling average selling price for off course homes increased to $262.37 per square foot, which is up by $2.51 per square foot. The twelve-month rolling average sales price increased to $882,710.13. No additional lots were sold during this reporting period. The rolling 12-month average selling price for vacant land, not on the golf course, stands 9.7% below vacant golf course property at $234,050.67 per acre.